You are currently browsing the category archive for the ‘Just neat stuff’ category. We recently re-added realtime METAR (Aviation Routine Weather Report) rosettes to the Scan B radar displays. The attached image shows the rosettes for Kithener-Waterloo and near Fergus, Ontario. These reporting stations are usually sited at airports and may or may not be automated. Their currency may lag by up to 2 hours, although they usually more current than that. The rosette EWR displays consists of a centre circle, to which a wind vane is attached, and is surrounded by three or four numbers. The centre dot may contain one of the following codes: M – no sky cover report (ie “missing”; a full white dot (clear sky), a full black dot (fully cloudy), or a partial black/white dot that is quartered in black and white in proportion to the relative cloud cover. 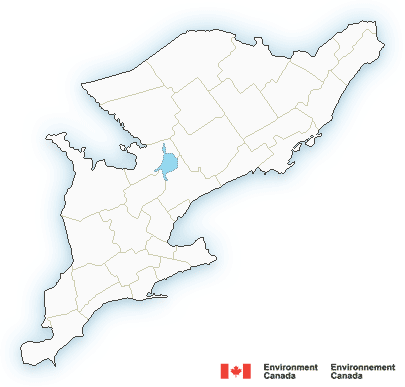 In the image, the KW cloud cover is “50%”. Additionally, our METAR dots will also show a red down-arrow (sharply decreasing pressure) or a green up-arrow (sharply rising pressure). These latter two items report in relation to storm cells typically. The outer rim of a storm cell will be strongly high pressure due to the storm cell downdrafts and outflow winds, while the storm centre or core will show a strong low pressure due to rising air in the cell. These rapid changes are indicative of a strong convection cell, and should be viewed as indicative of potentially severe weather imminent. The wind vane radiating from the centre dot indicates direction the wind is coming from; the “feathers”, the strength of the wind, in knots. There are two scale lengths to the feathers, long and short. A long feather is 10 knots, a short feather, 5 knots. The vane itself represents a 5 knot breeze. The top left number in white is the reported temperature in degrees Fahrenheit. The lower green number is the dew point. The upper right number is the last 3 digits of the atmospheric pressure in kilopascals, ie, for Fergus, “237” is 1023.7 kpl. Other chart symbols may show from time to time (we have no control over what comes down the METAR feed) – this chart link will show the many symbols which may turn up, depending on what’s on the feed at the time. The High Definition Earth Viewing (HDEV) experiment aboard the International Space Station (ISS) was activated April 30, 2014. It is mounted on the External Payload Facility of the European Space Agency’s Columbus module. This experiment includes several commercial HD video cameras aimed at the earth which are enclosed in a pressurized and temperature controlled housing. Video from these cameras is transmitted back to earth and also streamed live on this channel. While the experiment is operational, views will typically sequence though the different cameras. Between camera switches, a gray and then black color slate will briefly appear. Since the ISS is in darkness during part of each orbit, the images will be dark at those times. During periods of loss of signal with the ground or when HDEV is not operating, a gray color slate or previously recorded video may be seen. And everything that is said about 7 day forecasts is so true – beyond 5 days, not worth shite! Might as well be +1! CURIOSITY bites the dust, and lives to tell about it! PASADENA, Calif. – About two hours after landing on Mars and beaming back its first image, NASA’s Curiosity rover transmitted a higher-resolution image of its new Martian home, Gale Crater. Mission Control at NASA’s Jet Propulsion Laboratory in Pasadena, Calif., received the image, taken by one of the vehicle’s lower-fidelity, black-and-white Hazard Avoidance Cameras – or Hazcams. The black-and-white, 512 by 512 pixel image, taken by Curiosity’s rear-left Hazcam, can be found at: http://www.nasa.gov/mission_pages/msl/multimedia/msl5.html. While the image is twice as big in pixel size as the first images beamed down from the rover, they are only half the size of full-resolution Hazcam images. During future mission operations, these images will be used by the mission’s navigators and rover drivers to help plan the vehicle’s next drive. Other cameras aboard Curiosity, with color capability and much higher resolution, are expected to be sent back to Earth over the next several days. 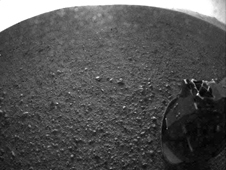 Curiosity landed at 10:32 p.m. Aug. 5, PDT, (1:32 a.m. EDT, Aug. 6) near the foot of a mountain three miles (about five kilometers) tall inside Gale Crater, 96 miles (nearly 155 kilometers) 7in diameter. During a nearly two-year prime mission, the rover will investigate whether the region has ever offered conditions favorable for microbial life, including the chemical ingredients for life. The mission is managed by JPL for NASA’s Science Mission Directorate in Washington. The rover was designed, developed and assembled at JPL, a division of Caltech. For more information on the mission, visit: http://www.nasa.gov/mars and http://www.nasa.gov/mars and http://marsprogram.jpl.nasa.gov/msl. Volcano KATLA (Iceland) ready to blow? Rumours are flying right now that volcano Katla in Iceland may be ready to blow. Increased seismic activity has observers on high alert to the possibility of a large eruption. Katla is a very large volcano that has erupted before. “A huge Icelandic volcano long overdue an eruption is showing signs of activity – threatening disruption to air traffic, experts have said. There have been more than 500 tremors at Katla in the south of the country in just the last month. An increase in activity at the site since July has also been causing volcanologists concern, when increasing temperatures and seismic activity caused a flood, washing away a road bridge. The last major eruption at the volcano was in 1918, and caused such a large glacier meltdown that icebergs were swept by the resulting floods into the ocean. Significant activity at Katla – which has a huge 6.2 mile (10km) crater – usually occurs every 40 to 80 years. It is feared when it does eventually erupt, it could be the most powerful activity the country has seen in almost a century. Catastrophic flooding could result as the frozen surface of the volcano melts, sending vast amounts of water into the Atlantic Ocean. 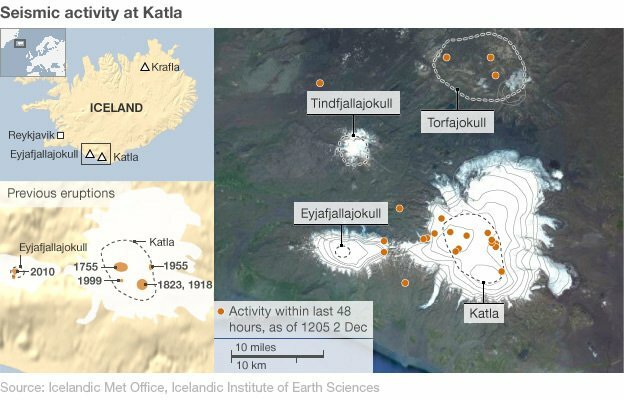 Volcano expert Andy Hooper, from Delft University, said although there had been increased activity at the site, it was difficult to predict if and when Katla would erupt. However, he told Sky News Online that the implications for Iceland if an eruption did occur would be “major”. “Because of the glacier on top, massive amounts of ice would melt, washing away the roads. “There could also be a big ash fallout on people living in the area and that will affect the farms. “There could be big implications for people there. Time-lapse video from the International Space Station as it circles the globe. Note especially the auroras and the lightning in the thunderstorms. Just for fun, see if you can pick up where its overflying as it moves around its orbits.